Does This Minneapolis Duplex Cash Flow? 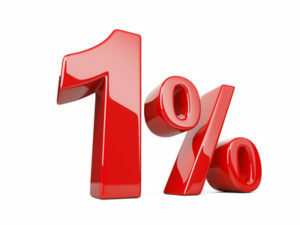 There's A 1 Percent Chance | Your best resource for buying, selling, owning and investing in duplexes and duplex homes. If you’re thinking about buying your first Minneapolis or St Paul duplex and want to know how to tell if it cash flows, you may find the one percent rule useful. Simply look at the total monthly rent for any duplex or rental property. If the number is one percent or more of the asking price on the property, it should cash flow. For example, let’s say there’s a duplex you’re interested in. Each unit has two bedrooms which rent for $1200 each or $2400 a month total. The asking price is $240,000. The $2400 is one percent of the $240,000, so the property should cash flow. Of course, then you should do a complete financial analysis of the property as there may be expenses that skew the rule of thumb. If the property has a high heat bill, or considerable deferred maintenance, the cash flow may not work at the asking price at all. There may be exceptions in the other direction as well. Let’s say the $240,000 duplex has rents that are $900 a month per unit, or $1800 total. Well, $1800 is not one percent of $240,000. However, market rent may be considerably higher, which may simply involve notifying the tenants of a rent increase after you own it to help the property meet or even beat the one percent rule. The rule isn’t meant to be the sole measure of whether or not a property is a good investment or if it cash flows. It is simply a quick way to determine whether or not you’re on the right track.